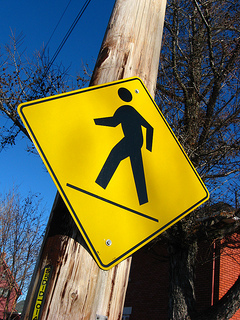 Pedestrian safety is often on our minds as a leading San Francisco personal injury law firm. Sadly, it has also been on the minds of many in our region lately, with multiple pedestrian fatalities and pedestrian injuries marking the end of 2013 and the early days of 2014. We are proud to represent the wrongfully injured, but we are even prouder of our commitment to prevention and we felt this was an important time to share some pedestrian safety tips. We recently wrote about the death of an 11 year-old boy who succumbed to injuries incurred in a pedestrian accident in Sacramento on December 22. Unfortunately, the threat to pedestrians in our region continued through the late days of 2013 and the opening week of 2014, as documented by a report in last week’s Oakland Tribune. The final day of 2013 saw two pedestrian fatalities in two separate accidents. One of the incidents claimed the life of a 6 year-old girl and led to the driver being charged with both failure to yield to a pedestrian in a crosswalk and vehicular manslaughter involving gross negligence. The trend continued into 2014 and, on January 2 at approximately 5 P.M., police were called to the intersection of Bush and Leavenworth Streets after a car hit a pedestrian. The victim, described by officers as a man in his 20s, was taken to San Francisco General Hospital in serious condition with life-threatening injuries. Police are investigating and talking to the driver, who remained at the scene. •	For Drivers – Always stay alert for pedestrians, paying particular attention in lower visibility conditions. Two special circumstances demanding extra vigilance include passing through crosswalks and backing up (children are especially likely to be victims of back-up pedestrian accidents). •	For Pedestrians – Follow traffic rules, look before crossing streets, and generally try to behave in a predictable manner so that drivers can anticipate your likely actions. Walk facing traffic and, while never assuming a driver can see you, try to make eye contact with approaching drivers. Stay alert to traffic and avoid distractions such as mobile communications equipment and music devices. •	For Parents & Others interested in child safety – Teach children pedestrian safety rules at an early age and model good behavior. Identify the safest walking routes in your area. •	For States and Communities – Develop partnerships with law enforcement, schools, and public health/safety groups to educate the public on pedestrian safety. Enforce pedestrian safety laws, including high-visibility campaigns focused on drivers who fail to yield to pedestrians. Identify trouble spots and consult programs such as Safe Routes http://www.saferoutesinfo.org/ for further advice on improving pedestrian safety in your community. We hope that this series of pedestrian accidents proves an isolated event and that these tips help prevent future tragedies. When a negligent driver causes a pedestrian accident in Northern California, we can help the injured pedestrian or grieving family recover critically needed monetary compensation. Call to arrange a free consultation with our experienced accident attorney. Update: After this was written, the San Francisco Chronicle reported on yet another pedestrian fatality in our region.